The Marqueen Hotel in Seattle calls the lively Queen Anne neighborhood home. 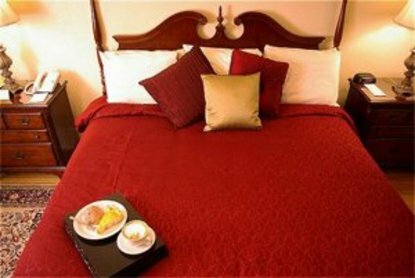 That means that guests of this charming boutique hotel enjoy easy access to restaurants, nightlife establishments, shops, and the Space Needle, among other things. Given the hilltop location of the Marqueen Hotel, guests are also treated to wonderful views of the Seattle skyline and Elliott Bay. Just a short walk from the hotel is Queen Anne’s Kerry Park, and it is an especially good place to take it all in. A great location isn’t the only reason to find favor with the Marqueen Hotel. Occupying a classic brick building that dates back to 1918, the Marqueen offers plenty of historic charm. In the elegant rooms, period inspired furnishings convey a sense of old world elegance. Modern amenities aren’t lacking, however. Flat screen TVs come standard, for example, as do iPod docking stations, DVD players, and air conditioning. Some of the rooms at the Marqueen Hotel in Seattle have full kitchens, while others feature kitchenettes. Also worth noting is the size of the rooms. Each accommodation offers anywhere from 400 to 700 square feet of living space. Outside of their rooms, guests of the Marqueen Hotel will find a lounge and a small spa that doubles as a salon. The lounge serves up both food and beverages and is open for lunch and dinner. At the spa and salon, guests can treat themselves to massages, facials, or maybe just a new hairstyle. For those guests who like to stay on top of their workouts while traveling, full access passes for a nearby fitness facility are available for an added fee. Valet parking is also available for a fee.